In Joseph Mitchell’s story “Up in the Old Hotel” the author stops to eat at a regular Lower Manhattan haunt of his called Sloppy Louie’s, and the owner, an old friend of his, convinces him to accompany him to the upper floors of the building, which was once the old Fulton Ferry Hotel and at the time of Mitchell’s story (1952) had been abandoned for decades. Louie had bought the old building and had opened his restaurant in it but had never ventured above the second floor because the stairs did not go further and to access the upper floors you had to ascend a ladder through the second-floor ceiling and then pull yourself up into the dark in a rusty lift with old ropes. Like two nervous schoolboys exploring a haunted house, Louie and Joe try to uncover the hotel’s past. My story about the Camlin is a little like that. After I wrote about “sneaking” into the old Camlin Hotel here in Seattle last year (see Trespass), the general manager of the hotel found my post and left a comment employing perfect comic timing and understatement, not only letting me know that I was busted, but also that I had missed a few things he would be glad to show me next time I was in the neighborhood. I am not allowed to name him nor the company that now owns the venerable property, but I contacted him last week and asked if I might come round for my grand tour. Mara got wind of it and wanted to come too, so I took a long lunch and Angela and Millie made a large sacrifice (skipping an important midday nap for Mills) by bringing Mara downtown to meet me at the old hotel. As it happens, the general manager (we’ll just call him GM) is a person uncommonly well suited to the managing of an old hotel like the Camlin. He loves history. He is a regular visitor at the same local history-related websites I frequent, and he is persistent and resourceful in teasing out tangible bits of the historic Camlin from the mists of the past. In the very little free time that overseeing the operations of a busy time-share location leaves him he has amassed — is amassing — an impressive collection of ephemera — articles, postcards, advertisements, menus, brochures — related to the Camlin and its famous (though now erstwhile) Cloud Room. Using eBay he has even found such odd items as salad plates with the Camlin logo and letters from former managers to prospective VIP visitors. A note he showed me from many years back states that one Ozzie Ozborne contacted the hotel staff late one night to tell them that there was someone lying on the sidewalk near the front door. A later note informs us that the person had jumped and was pronounced dead at Harborview. The GM with some of his treasures. 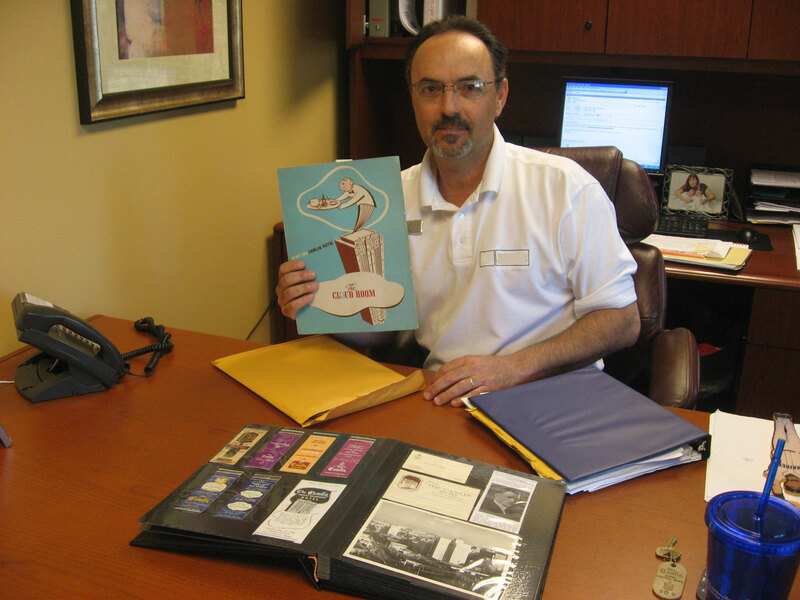 In addition to the collection he has formed, GM’s office holds a series of red-cloth-bound log books dating back to 1979, with entries written in many hands and in many shades of blue and black ink, detailing the salient events of any given day, such as fights breaking out between besotted patrons of the notoriously lively Cloud Room. There is also a set of smaller books, also bound in red-cloth, that the bartenders logged separate nightly reports in, mostly about which patrons got so plastered that they were cut off. It’s all there in writing, so if you misbehaved at the Cloud Room anytime in the last quarter of the twentieth century, the details have been duly noted for posterity. GM said the logs were lively reading and I would love to have simply kicked back and read some of their entries, but Mara was soon spinning complete circles with the chair we had deposited her in, so GM grabbed some keys from the front desk and we hit the elevator. Entering the (in)famous Cloud Room on the eleventh floor, now a quiet place for guests to read or take in the view. First stop was what is left of the Cloud Room. The sign is still there above the door to the back portion, which is now simply a quiet lounge area with a stunning view. According to GM, and you could google this or TiVo it or whatever, a scene from the movie The Fabulous Baker Boys pans through this room as Michelle Pfeiffer is yelling at the Bridges Bros., and out the window you can see the lit sign on the roof of the Roosevelt Hotel, the other surviving Seattle hostelry famed for its neon. 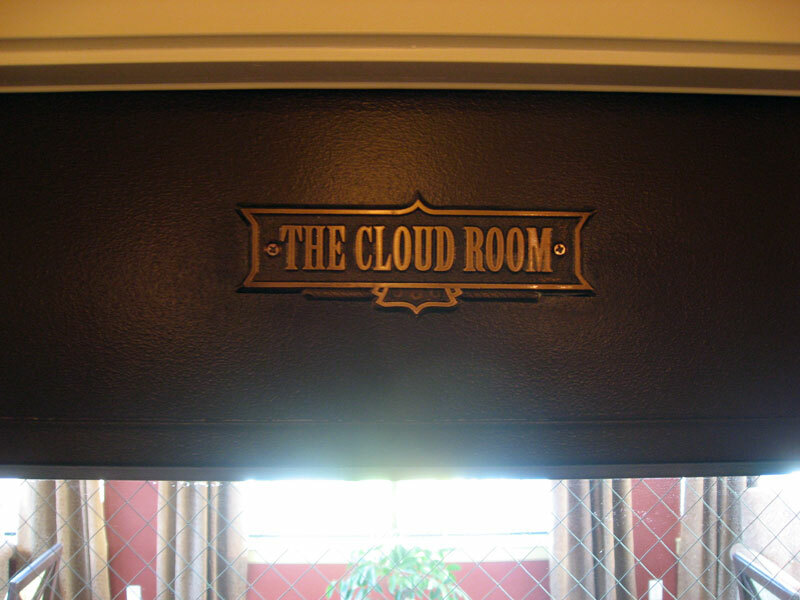 GM got a lot of hate-mail when the hotel’s new owners closed the Cloud Room in 2004 and added several penthouse suites, even though they thoughtfully named them Cumulus, Nimbus, Cirrus, etc. as an homage to the great old skyscraping pub. 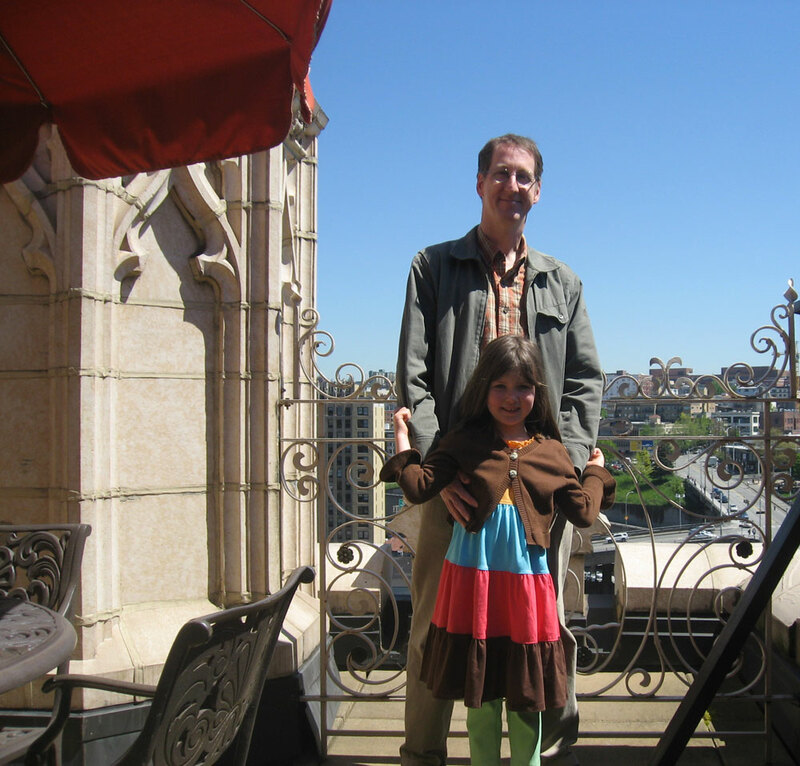 On the terrace of one of the penthouse suites, where patrons of the Cloud Room once took in the night air after a show at the Paramount nextdoor. 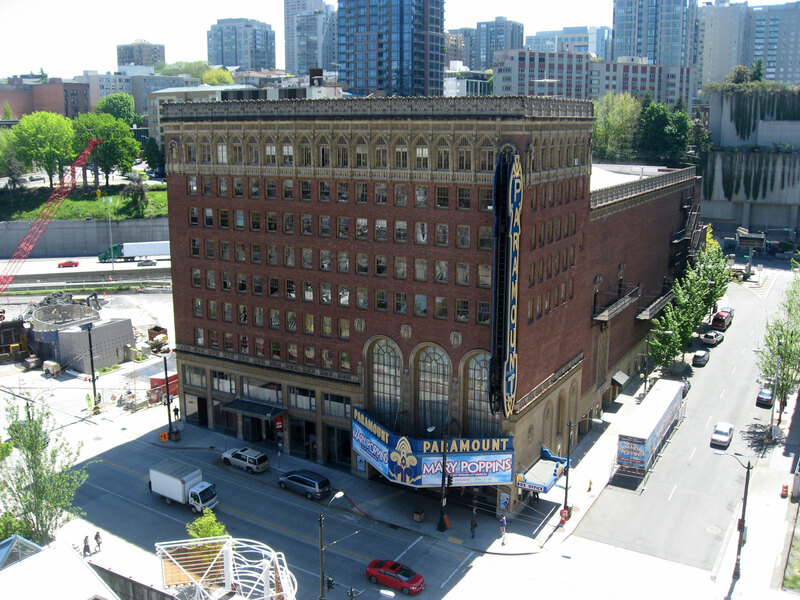 The Paramount nextdoor. It's not every day you get a chance to photograph an old showboat like that from the roof of an old inn like this. Next GM showed us one of the penthouse suites, and then we descended a few floors and toured one of the more modest rooms on the north side. I would have taken some photos of these rooms except that a) Mara’s attention span was better served by moving at GM’s clip, which was not slow enough for me to really think out my compositions, and b) I was too busy listening to all the fascinating historical factoids that GM was telling me. An example: the mahogany doors that once fronted each room were not usable in the renovations the new owners made because they would not meet fire code specifications, so they now comprise the bar in a pub on Capitol Hill called 22 Doors. A museum in the basement depicting one of the original kitchens uncovered after being sealed up for decades. Wha--- is that a ghost? 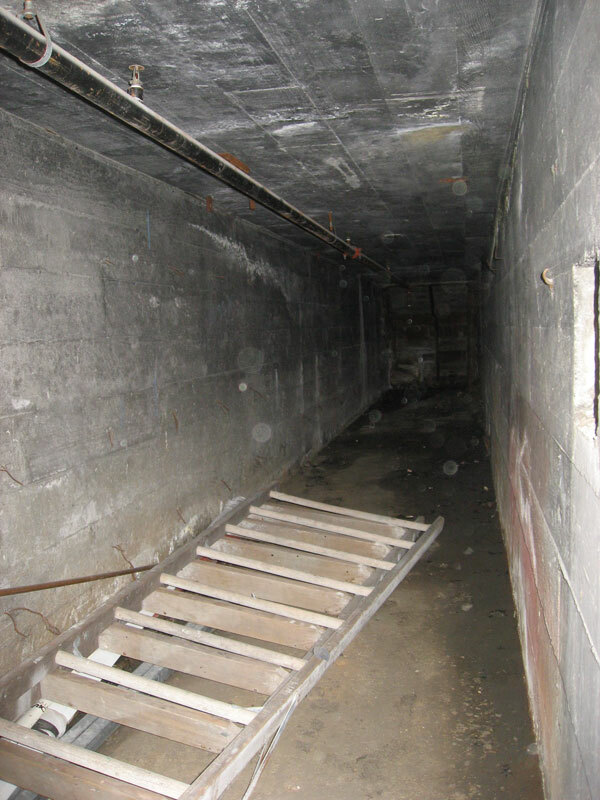 One of the many mysterious little anomalies in the basement of the old hotel -- a hidden storage area. Lastly we descended to the basement, which I must admit turns out to have been my favorite part, despite the view from the Cloud Room (still a nice view to the south even though the famous views of the water to the west and the Space Needle to the northwest have been forever occluded by new highrises) and the view from the penthouse terrace. Down here are mysteries…mysteries I tell you. Before going through one set of doors, GM paused to bid us bear in mind that the hotel was built in 1926, smack dab in the middle of Prohibition, a time when anyone building a hotel might have taken great pains to make sure that their guests could…let’s see…enjoy a full range of refreshments, as Americans of the high class and growing middle class felt they were entitled to do, regardless of what the law said. I may be mistaken about this, but I think many good people regarded Prohibition as a temporary inconvenience they knew would surely end, and with which they must “play along” until it was over. 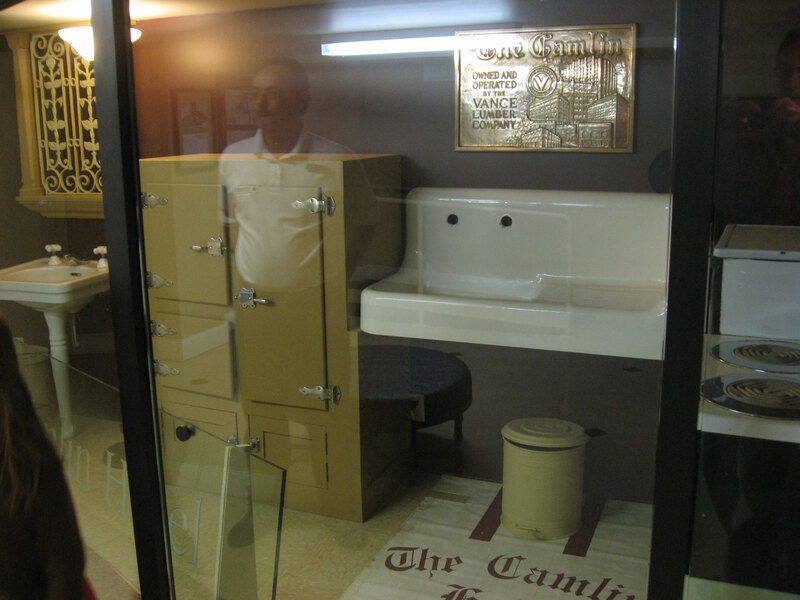 In any case, the person who built the Camlin (the son of the man who built the church next door) built it with $800,000 siphoned from his father-in-law’s bank (one indiscretion among many that eventually earned him a long stay as the guest of the state at a facility in Walla Walla). This tunnel just goes out toward the back alley. The question is...why? So it is puzzling, but not surprising in the least, to find tunnels running off here and there and hidden rooms and staircases that rise a few steps and then stop at blank walls. GM first showed us a long hallway that ended at a big delivery door. Low along one wall of the hallway was a hole covered in plexiglass, the forgotten entrance to a strange, low-ceilinged room that was rediscovered only a few years ago. Behind this window a light was left on and you could see the base of a ladder that rose up to a hole in the ceiling, leading to another hidden room on top of the first. They were last used as storage rooms for old junk the hotel was shedding, including a huge Vance Lumber Company sign that used to hang out front (the Vance Lumber Company owned the hotel for a time). GM believes that this hallway was used to bring in the booze when the front door might have been watched, and these hidden rooms were used to store it. A dumbwaiter that has since been removed would have completed a path to the guestrooms upstairs that liquor could travel without ever having to pass through the publicly accessible parts of the house. 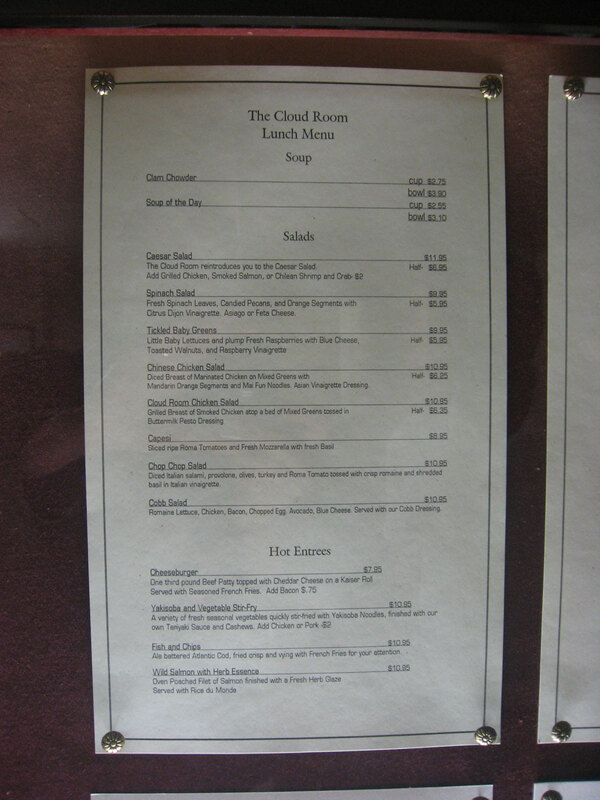 The lunch menu at the Cloud Room the last day it was open. We stopped in the kitchen to sample some homemade pozole that one of the staff had brought in to share (muy delicioso… ¡Muchimas gracias, Maria Lena!). 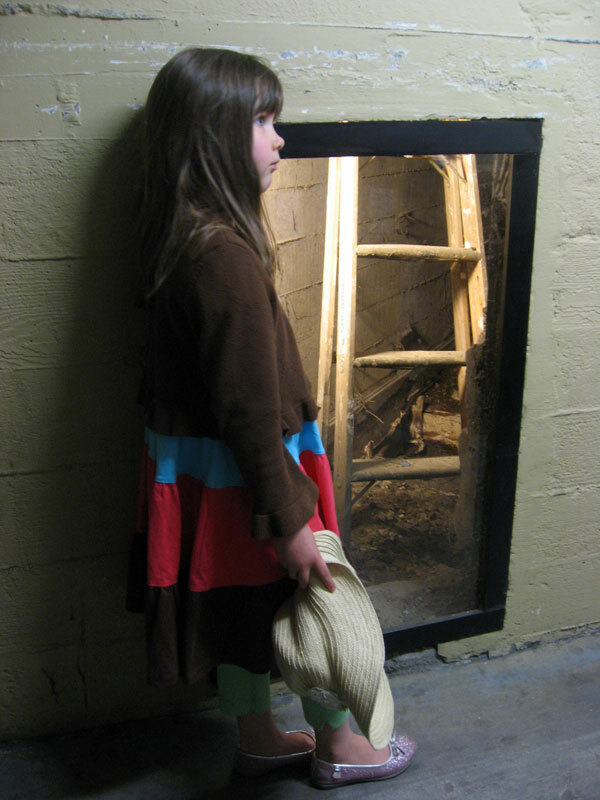 Mara and I had to go after that, but I left all bothered about those tunnels and hidden rooms in the basement. And there are still further mysteries that haven’t even been identified. As we passed out of the boilerroom on our way to somewhere else, GM rapped his knuckles on a wall of bare sheetrock put up before his tenure began more than a decade ago, a wall that encloses a space unaccounted for, and said with one raised eyebrow, “still have to get in there”. NOTE: For a great article about the men who built the Camlin by my mentor from my days at Washington Magazine, local author and historian J. Kingston Pierce, see this excerpt from his book Eccentric Seattle: Pillars and Pariahs Who Made the City Not Such a Boring Place After All. Order it from your local indie bookshop. I’m low on stories I can share with you at present (which is not to say that life is dull), so here’s the third installment of just something I saw on my wanderings today and thought you might enjoy. Because I know certain of you will not let me get away with simply flinging this up here without comment or justification, I’ll just say that whenever possible I try to frame the urban architecture in such a way that it appears to be other than what it is, which is a bunch of big boxes full of stressed-out people most of whom wish they were elsewhere. Today, as often, I saw the hardscape flattening out and becoming panels of texture, so that only the greenery anchors the scene in space. 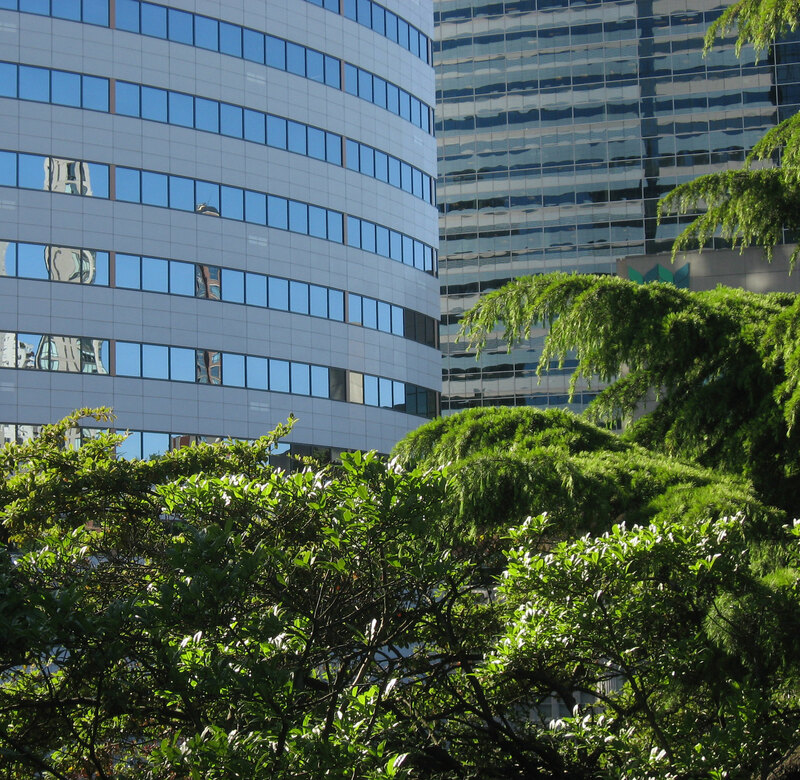 Seen this way, the buildings almost behave like tapestries hanging just behind the trees. In truth, the foliage and the blueing towers lie on opposite banks of the great river of Interstate 5. Edges merge and space compresses, if you squint a little. Poor Emilia is having trouble sleeping these days. We know she is teething — one of her lower teeth just arrived this morning — which is very painful, and we know that babies on the cusp of developmental leaps can experience unquiet slumbers as well, and Millie has been up on her feet a lot lately preparing to cruise, and generally getting her hands on items at levels that not so long ago represented distant planes. Today we have whisked potted plants and lamps and important papers off of table tops that she only began reaching this morning. It could also be that she is being revisited by the gastric discomforts that plagued her first weeks. If she can reach it and it's loose, it goes on the floor. In any case, she wakes up a lot, and in particular she wakes up unhappy several times between the hours of 4 a.m. and 7 a.m, when I am accustomed to getting the kind of sleep that is most restorative to me. I can be up at 1 o’clock and 2 and even 3 without serious fallout the next day, but for the past two months or more we have been wakened at 4:45, 5:30, 6:10, the kinds of times you associate with train schedules in romantic adventures. Again, and I can’t remember how many times I’ve said this, our trials are small ones, and joyful on the whole. I know some of you have it a lot worse. And we signed up for this, we totally did, and I wouldn’t trade it — the payoff is not even a distant future one, it’s right now, when Emilia sees me come in the door and smiles with her entire head and lifts her arms because she wants me to pick her up. Nevertheless, we are tired. Parenting a baby is physically demanding, and it quite knocks the poop out of you when you’re closer to 50 than 40. And I’m not even necessarily talking about GOOD parenting, I’m just talking about the basic business of keeping the offspring alive, like any rock troll would do. Angela was teaching tonight, and so after I rough-housed with the girls on the living room floor (modulated to a gentler version when Millie piles on, which she does with gusto) and after Millie’s routine — feeding, diaper change(/slap fest), more feeding, books (optional, depending on how tired she is) — and after Mara’s routine — cleaning up toys, herding into jammies (this will never happen without a degree of wrangling), teethbrushing (she still likes to sit on my leg as I kneel and have me do them, because it is an intimate tradition), potty break, fetching nighttime lovies from around the house, filling water sippy, books, and sometimes a story — and after going to soothe Millie several times with a shooshing sound we do that settles her down, I began clearing dinner plates and doing the dishes. I saw my Day mug. The Day mug is a mug that my Aunt Jean gave me one year long ago, when I was in my thirties. It was made by my cousin Sue, or rather a woman named Sue who was once married to my cousin John. I didn’t know her well at all, and I don’t know that I’ve seen her since my aunt gave me the mug, because she and my cousin went separate ways shortly afterwards, and thereafter she did not accompany John and their kids to the family reunions. I would not know her in a crowd today, and I would feel odd calling her my cousin, though “by the chart” she still is. 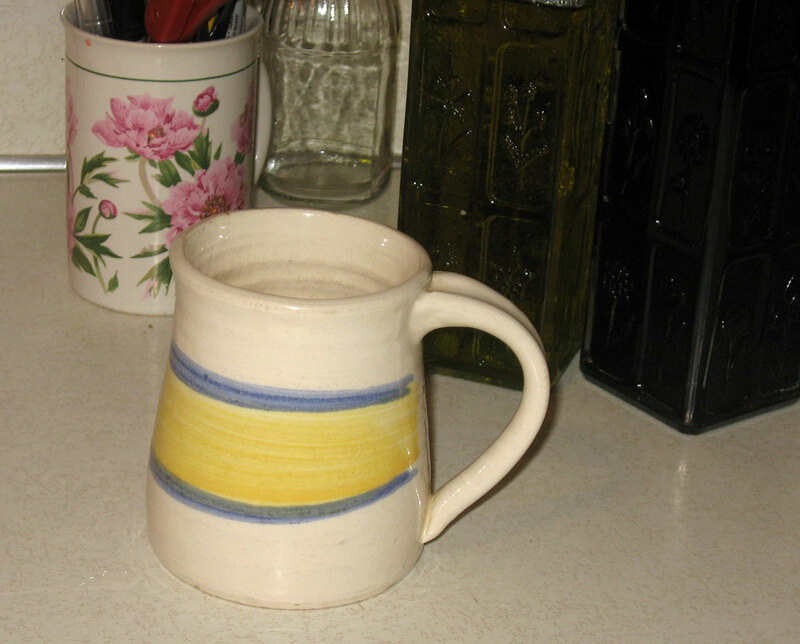 The mug is an off-white color, larger at the bottom than at the top, a little like a garden watering can, and has a simple design of two narrow blue stripes with a broad yellow one between them. I don’t know when I started thinking of it this way, but during my loneliest days before I met Angela, when I was struggling to make ends meet as a freelance writer and my life seemed to be consistently visited by unfavorable winds, it occured to me that it is not for nothing that the sun rises and sets each day, that every morning we get another chance to work out our salvation, to do our best, to make things right if that’s what’s up for us, or to fling ourselves into the adventure if that’s our thing. And this simple design — a broad yellow swath of cheery day enclosed and sealed by two blue bands of absolving night — reminded me of that truth. I started referring to it as my Day mug, because it looks like a single day and reminds me that I have everything I need — enough energy, enough love certainly — to get through one day, which is all I ever have to do. I saw my Day mug on the counter tonight and it did what it was supposed to do. It lightened my load. I wasn’t even drinking out of it. Thanks Day mug. Thanks Aunt Jean. Thanks Sue, wherever you are. You have no idea what the clay you spun with your hands has become. A few days ago Mara asked me to tell her a story. We used to tell her a story every single night at bedtime after reading and after turning out the light, and there were very few repeats, although when we started reading her The Wind in the Willows and the Pooh books and the Oz books and other chapter books this practice of making up stories for her ceased. Now she asks me to tell her a story at all times of the day, while I’m rushing around preparing to go to work and when we sit down to eat. For the last, oh, ten months I have been too exhausted to enjoy the effort it takes to craft a story in my head from scratch, and if truth be told many of my stories (I will not say Angela’s) Mara will recognize later in life when she reads cliassic literature such as Tolkien’s Smith of Wootten Major (the beautiful and haunting companion story to the lighthearted Farmer Giles of Ham) or listens to, say, The Byrds’ “Chestnut Mare”. “Was that their names?” interrupted Mara. My wife interrupted. “What kind of names are those? And why would they just say their own names?” Angela demanded with what I would call a sneer except that it was lighthearted and not intended to injure, so let’s call it a snort. 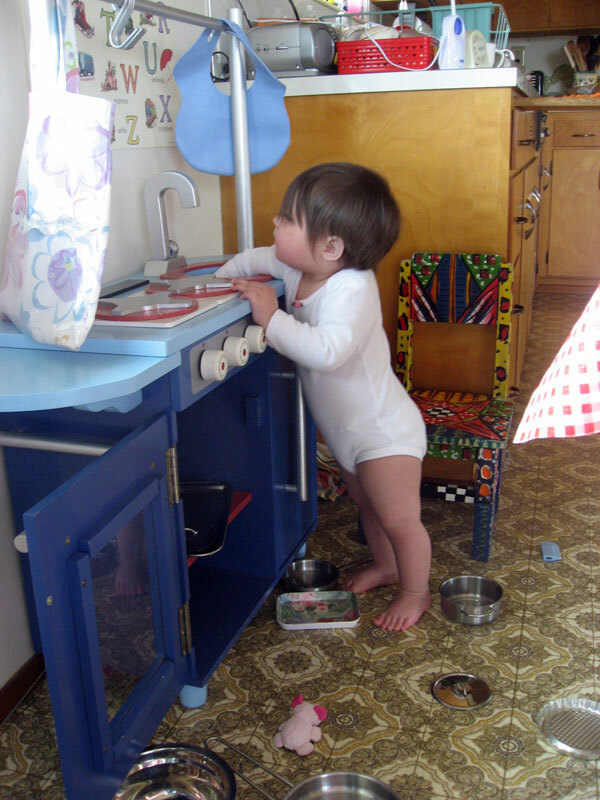 “Well it just seems goofy.” She spilled another handful of oatie-os onto Millie’s tray. Millie began picking them up carefully and putting them into her mouth and sucking on them. 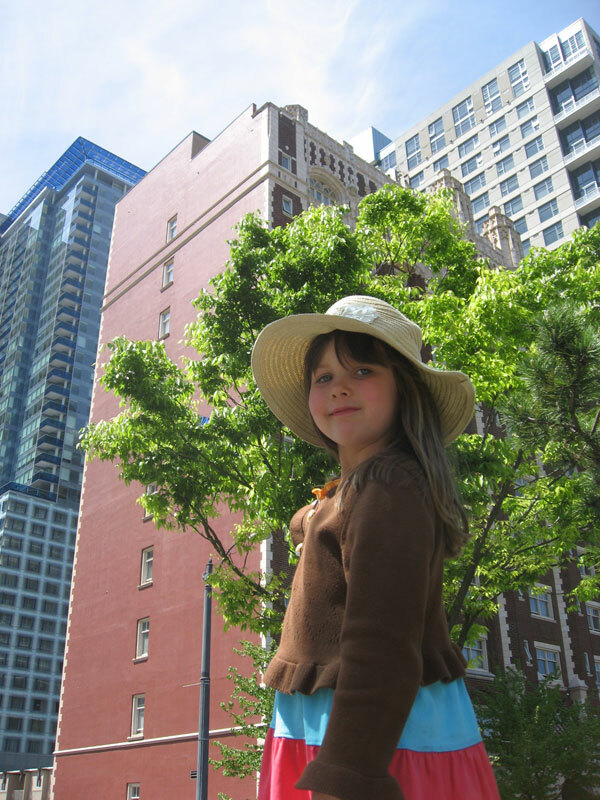 “Right,” said I, adjusting to the picture that I now saw in Mara’s mind of perhaps a girl her own age in what she had already intuited would be the starring role. “She. “And Uh-huh said ‘uh-huh’, and she went and opened the door for her. “So finally they came into town, and as they were walking along the street they were arrested –“ (here I paused for a tense moment and lifted my nose slightly) “by the smell of fresh-baked apple pie. And the three children followed the wonderful aroma into the bakery, where the baker was just pulling a pie out of the oven and setting it on the counter to cool. “And the baker looked up and, recognizing the children, said ‘Nuh-uh!’ And so Nuh-uh didn’t get any pie. “And the baker said ‘Uh-uh!’ And so Uh-uh didn’t get any pie either. That was the end of the story. Since I often have no idea how they will end (like my blog posts) I was rather pleased that this particular story seemed to finish with a nice sharp crack. Mara went on with her dinner, which is not to say she didn’t enjoy the story, but she takes these things for granted sometimes. Angela was still shaking her head as though she were trying to figure out how to break it to her Facebook crowd that she had married a buffoon. Mara asked for the story again the next night at dinner, and I told it again. Again Angela took me to task about why each of the characters just said their own name, and expressed disapproval with her entire lovely face. 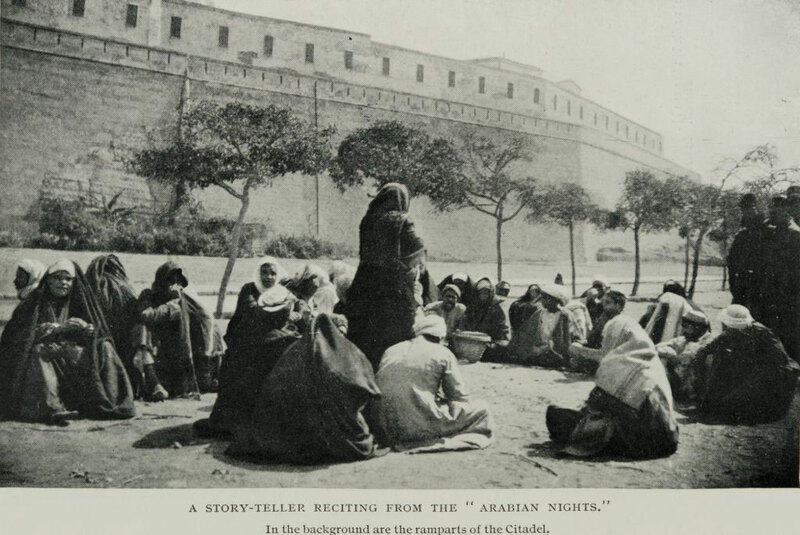 A storyteller in 1911 holds her audience spellbound. This image comes from the Travelers in the Middle East Archive (TIMEA) and is licenced through Creative Commons. Angela aired her complaint afresh, as though the story should make more logical sense somehow, but I tendered my opinion that Mara, for whom the tale was made, did not seem to suffer from a similar inability to suspend disbelief. In fact when I asked Mara to explain to Mommy why the children just said their names, Mara said that maybe they were just saying their names and those people thought they were answering them. I thought this explanation represents a pretty fatalistic and bleak view of the world, and I don’t think Mara really thinks this when she hears the story, but for Mara, hearing a story and theorizing about its dramaturgical devices are activities with different goals. She hears the story apart from any internal editor telling her that things have to make logical sense. It makes poetical sense to her. It ends as it should. And why wouldn’t there be three siblings so named? Mara is untroubled. Yet my true love chafes. I have made up hundreds of stories for Mara on the spot — as has Angela — some silly, some beautiful, some didactic, some a little spooky, but none of them have ever met with this kind of critical panning by my co-author. She suggested I blog about it. Maybe you all can explain it to her. Emerson-like, I refuse to defend myself (that is, like Emerson I write an essay defending myself instead). But I think there are at least several ways to understand the story, which is why I think it’s destined to become a family classic. Your turn. What do you make of it? There are no wrong answers.